I was down in Disneyland this past weekend with my girlfriend and two of our bff’s, Ken and Abbi. I have not braved Disneyland during the holiday season in quite some time because I am more of an “off-peak” kind of guy, but Ken and Abbi really wanted to go see the decorations so we decided to brave the crowds, too! All in all, it was a very successful trip even if my feet practically fell off by the end of the third day (must be that winter weight…). We arrived on Friday morning, flying into John Wayne, and when we arrived the airport was getting pounded with what I can only describe as Noah’s Ark level rain. It was tremendous! We were a bit worried that Disneyland was going to be flooded but some how, some way, Disneyland itself was dry as a whistle when we arrived around 11 AM. This was actually quite a good thing, because the rain earlier scared off a lot of the annual pass holders, so crowds were not as bad as they might have been otherwise. We were in the park Friday, Saturday, and Sunday… but enough about logistics, let’s get to the details (behind the fold)! 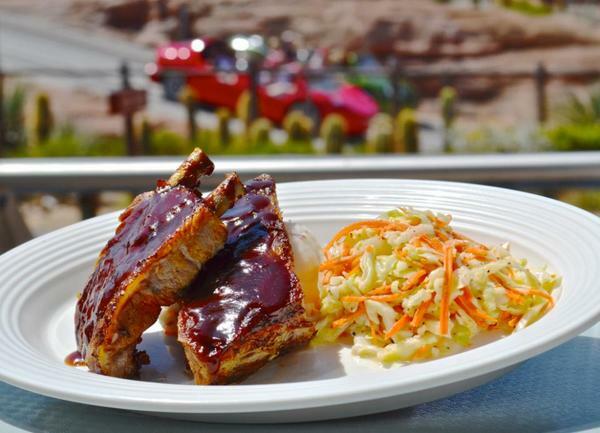 Flo’s V8 Cafe: Definitely solid comfort food here and enough on the menu where you can go a few times and have different dishes. We happened to try the ribs and mashed potatoes plate, with a side of Mac N Cheese, and we both thoroughly enjoyed it. Hit the spot on a chilly day. Carnation Cafe: This cute little gem is basically hiding in Main Street USA in Disneyland. 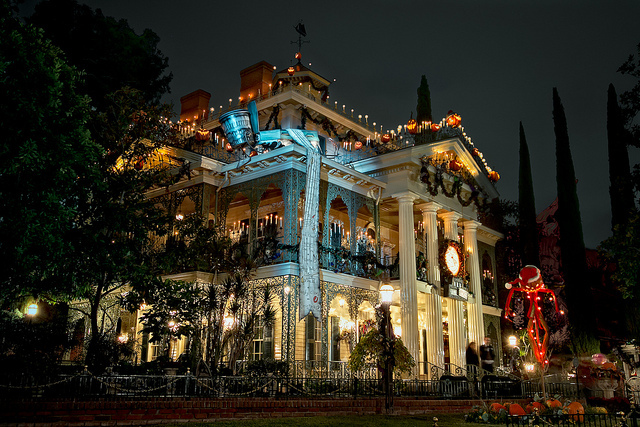 I originally wanted to get Plaza Inn, but there were no reservations. This place was also quite tasty and the chicken fried chicken was definitely a hit and actually had a nice hint of buffalo kick to it. But, the mashed potatoes and buttermilk gravy helped neutralize the slight kick, which was perfect. I also splurged for a Vanilla malt and I was not disappointed. 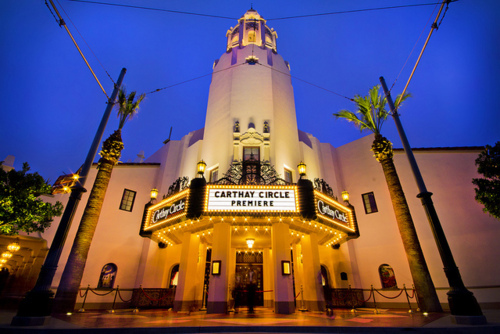 Carthay Circle: Yep, now we’re talking, right? None of us had ever eaten here so we wanted to try it, basically in lieu of the Blue Bayou. Though it was cold we requested a seat on the terrace and we got it. We had to bundle up, but the atmosphere was intoxicating – the views of the Christmas decorations and listening to the Christmas music (or live carolers) outside was awesome. The food was absolutely exquisite. Better than Blue Bayou, and more comparable to some of the fine dining at Walt Disney World, actually. I got the pork chop, and it might just be the best pork chop I’ve ever had. The gooey cheese ball appetizer was Heavenly and the Valrhona Caramel-Chocolate Turnover for dessert was a fantastic way to top it all off. In addition to the amazing food and atmosphere, our waiter, Alex, was great, too. He chatted us up whenever we got chatty, and he was super helpful even while we lounged there for over two hours. Not once did we feel rushed. Some honorable mentions? The Mac n Cheese Hot Dog at Refreshment Corner (Main Street USA) was a surprise find that I could not turn down. 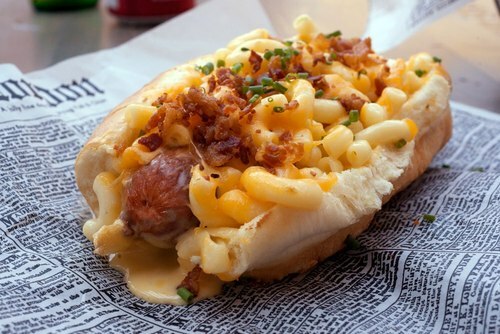 If you like hot dogs, or mac n cheese, or both, you need to try this. We also grabbed some pasta at the Boardwalk Pasta & Pizza in California Adventure and it was a huge, hearty plate of delicious pasta. Great lunch that kept us full until Carthay Circle later. Ok, ok… enough about the food, right? Let’s talk about some of the experiences. First and foremost, we finally saw one of Disneyland’s feral cats hanging out in California Adventure. The best part about this is that my girlfriend, up until this point, actually thought the whole ‘cats at Disneyland’ thing was just an urban legend. One of the unsatisfying parts of the trip was Disneyland’s new transition to Fantasmic FastPasses. We watched World of Color in California Adventure, then walked over to Disneyland, and a combination of the fireworks and Fantasmic basically turned the left half of Disneyland into a parking lot. No one could really move anywhere. It took a long time to get a pretty small distance. I know this is new for Disney, but they’ve got some serious fine tuning to do. Lastly, the crowds… oh, the crowds. Friday was pretty easy going because, as I said, I think the early morning rain scared people away. But, Saturday more than made up for that and so did Sunday, both of which I’d put between 8 and 9.5 on the Disney crowd Richter scale. But, in true form, we arrived at the parks at rope drop both Saturday and Sunday, and we accomplished A LOT in those first three hours. The trick to tackling rides is still to just get there when the parks open. Sadly, I’m back at home now, once again having Disney withdrawals which I am sure we can all relate to. But, looking forward to the next trip whenever that may be!